Cumin is commonly used in our family dishes. Here is my father’s cooking for Chinese cumin tofu. I don’t know about other regions in China, but in Hunan province, cumin is widely used in the local dishes. For example, Hunan local restaurant has one famous dish called cumin beef, which is the beef threads stir fried with hot red chillies and dried cumin seeds, very strong flavour of hot spicy and cumin. My parents, although coming from Sichuan, have learnt to use cumin in our family dishes. There are two types of cumin we can buy from local food market, one is the dried cumin seeds, another is the cumin powder. 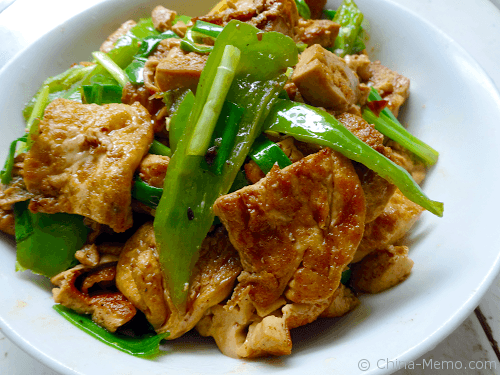 This Chinese cumin tofu is spicy but not that strong as the locals would make. We used cumin powder but you may use the cumin seeds too. This lovely dish is hot spicy and with a special flavour of cumin, very tasty. • First to prepare the ingredients. 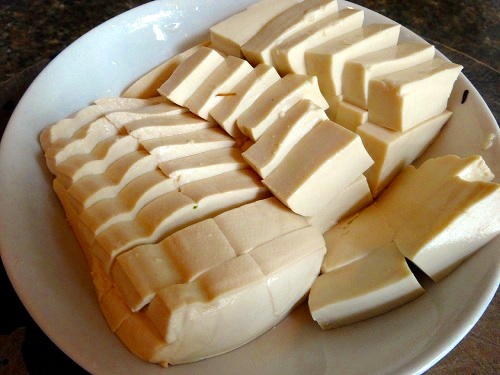 Cut the firm tofu into small, rectangular pieces, about half inch thick and 1 inch wide. 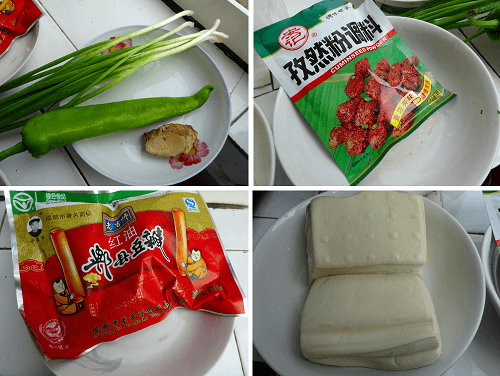 • Cut the green chilli into small threads, ginger into thin slices, and the spring onion half inch long. Set aside. • Heat up the wok and add oil, wait till smoky. 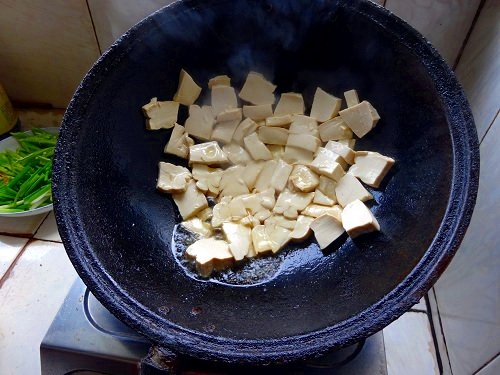 Add tofu to fry. Once the bottom side turns to golden brown, carefully turn the tofu around and fry another side till browned. 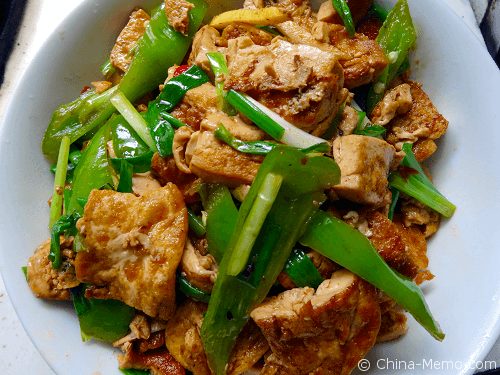 • Once both sides of tofu are cooked, add green chillies and ginger. 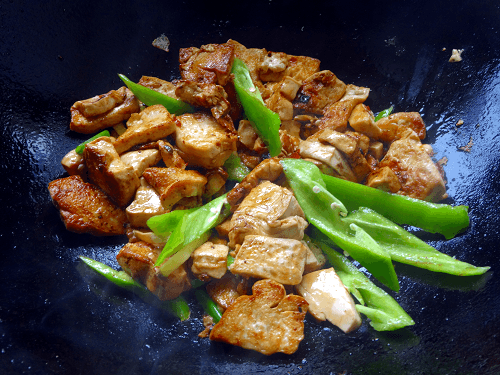 Fry with tofu for about 2 minutes. Then add water or stock, just about to cover the bottom part of the food. Cover the lid to cook about 3-4 minutes or till the liquid is gone. • Open the lid and start to add seasonings, salt, soy sauce, and cumin powder. Mix the ingredients with tofu and green chillies. • Before finishing, add the spring onions to mix well. Once done, move to the plate and serve in hot. If you like this recipe, please Like it in Facebook and share with friends, thanks.